You have a Joomla website to sale and introducing products, you are looking for the best solution to introduce for your website. 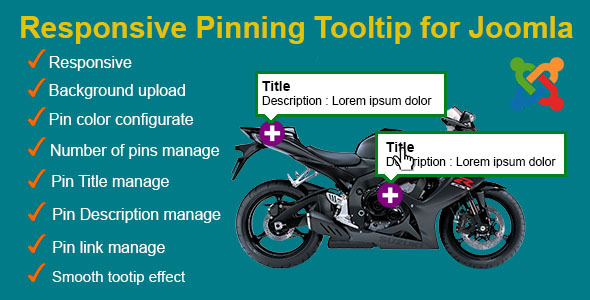 Come with “Responsive Pinning Tooltip for Joomla”, a very powerful module and useful for your website. You can upload background image, this image can be a product, or a products group. You can also create the pins, and data for them, like Title, Description … the description will work as a tooltip with smooth effect, and you can adjusting the position of each pin to match the each part of the product (or each product). very easy to configure and use, you have a module very nice and exciting, creating excitement and curiosity for your customers. if there are any questions or problems, do not hesitate to contact me. Admin can be pick color for pins.